Coronary bifurcation lesions account for approximately 15%–20% of percutaneous coronary interventions. Due to their association with procedural complications such as restenosis and adverse events, they are considered a subset of complex lesions. Although provisional stenting remains the default strategy in such cases, stent placement in the main branch may lead to side branch ostial stenosis, compromising side branch access. In such cases, sequential proximal optimizing technique (POT) in provisional bifurcation stenting may be useful. In this case of bifurcation lesion in the left anterior descending artery (LAD) diagonal, we treated through single-stent implantation with POT-side-POT technique. A 62-year-old female presented with intermittent episodes of left-sided chest pain and sweating for the past 2 days. Electrocardiography showed nonspecific ST changes in anterior leads [Figure 1]. Coronary angiography through femoral access revealed an LAD diagonal bifurcation lesion (medina 1, 1, 1) with the involvement of a diffuse lesion from proximal LAD to mid -LAD causing 90% stenosis and a lesion at the ostium of the diagonal causing 55% stenosis [Figure 2]a. A guide wire was crossed into the main LAD followed by diagonal LAD. Predilation of main LAD was done sequentially with 1.5 mm × 10 mm and 2.0 mm × 15 mm SC Sprinter Legend balloons at 10 atm, followed by a 2.5 mm × 12 mm NC Sprinter balloon at 10–12 atm. Proximal to mid-LAD was stented with a 2.5 mm × 23 mm everolimus-eluting Xience Prime stent (Abbott Vascular, USA) at 12 atm [Figure 2]b. Carinal shift was noted toward the diagonal ostium leading to 80% stenosis at the ostium of diagonal LAD [Figure 2]c. The main LAD was then postdilated for POT with a 2.75 mm × 9 mm NC Sprinter Legend balloon at 12 atm, followed by a side branch ostial dilatation with 2.5 mm × 12 mm NC Sprinter Legend balloon at 10 atm and another main LAD postdilatation for final POT with 2.75 mm × 9 mm NC Sprinter Legend balloon at 15 atm [Figure 2]d and [Figure 2]e. Thus, the POT-side-POT technique was performed successfully. The procedure was uneventful and good result with thrombolysis in myocardial infarction III flow was achieved in both branches [Figure 2]f.
In the present case of management dilemma for the coronary bifurcation lesion in LAD diagonal, we opted for provisional stenting using POT-side-POT technique over conventional two-stent implantation strategy. Literature also suggests similar outcomes with one-stent strategy and two-stent strategy in terms of risk of cardiac death, target lesion revascularization, and stent thrombosis in the management of bifurcation lesions. In addition, no advantage was conferred to implantation of two stents regardless of lesion type. In our case, diagonal ostium was not predilated before stenting. When carinal shift was noted after LAD stenting, first POT was done in main LAD, wire was recrossed into diagonal side branch, and then strut and ostium of diagonal were dilated with a balloon, followed by final POT into main LAD. Of note, no side branch kissing was done. Satisfactory result was achieved. The presence and features of side branch lesions at the carina level may influence the management strategy. In the present case, the diagonal branch was less diseased than the LAD. Further, the angle between main LAD and diagonal LAD was wide enough to predict lesser chances of major carinal shift toward diagonal ostium and at the same time was not more than 90° to facilitate recrossing of wire and hardware in case of any likelihood of major diagonal occlusion. Hence, we decided to deploy a stent from proximal LAD to mid-LAD. Usually, final kissing balloon inflation (KBI) is considered necessary for stenting of the main branch and the side branch. Although proven to decrease side branch stenosis, this technique has failed to improve major adverse cardiovascular event rates when compared to non-KBI techniques. Further, the failure of main branch and side branch diameters to match the fractal law may result in unequal, linear fractal ratios at the bifurcation. In turn, this may give rise to complications such as proximal stent deformation, arterial overstretch, stent strut obstruction, side branch stenosis, elliptical deformation, and malapposition. The POT-side-POT technique has managed to overcome these drawbacks. Earlier, a fractal bifurcation bench study by Derimay et al. had demonstrated that POT-side-POT technique was significantly better than KBI in terms of maintenance of circular geometry and reduction of arterial overstretch, side branch obstruction, side branch stenosis, and strut malapposition. Another interesting case of LAD bifurcation lesion with diagonal involvement was reported by Gerbay et al. Initially, they opted for single-stent strategy with provisional stenting. When plaque shift was experienced, a guide wire was crossed into the side branch, and simultaneous kissing balloon (SKB) technique was performed. Suboptimal angiographic results necessitated the placement of a second stent in the diagonal branch using T and protrusion technique. Due to inability to position the stent deep inside the side branch, removal of the stent and additional balloon predilatation were performed. Finally, mini-crush stent technique was performed on the bifurcation. This case is similar to ours in terms of the LAD bifurcation lesion with diagonal involvement and the initial decision to provisionally implant a single stent. However, we did not perform the SKB technique or the mini-crush technique. Instead, we opted for the POT-side-POT technique without KBI technique to avoid further injury or dissection of ostial diagonal LAD. Our case also highlights the need for developing classification of coronary bifurcation lesions based on great diversity among their anatomical features. In the present case, there were lesions in the main vessel as well as both contiguous branches. Hence, it may be considered as either a bifurcation or trifurcation lesion remains questionable. Many interventional cardiologists opt for provisional stenting as a default strategy when faced with coronary bifurcation lesions. In this case, we opted for the single-stent strategy with POT-side-POT technique and not KBI. The procedure was successful. Sawaya FJ, Lefèvre T, Chevalier B, Garot P, Hovasse T, Morice MC, et al. Contemporary approach to coronary bifurcation lesion treatment. JACC Cardiovasc Interv 2016;9:1861-78. Murasato Y, Finet G, Foin N. Final kissing balloon inflation: The whole story. EuroIntervention 2015;11 Suppl V: V81-5. Derimay F, Souteyrand G, Motreff P, Guerin P, Pilet P, Ohayon J, et al. 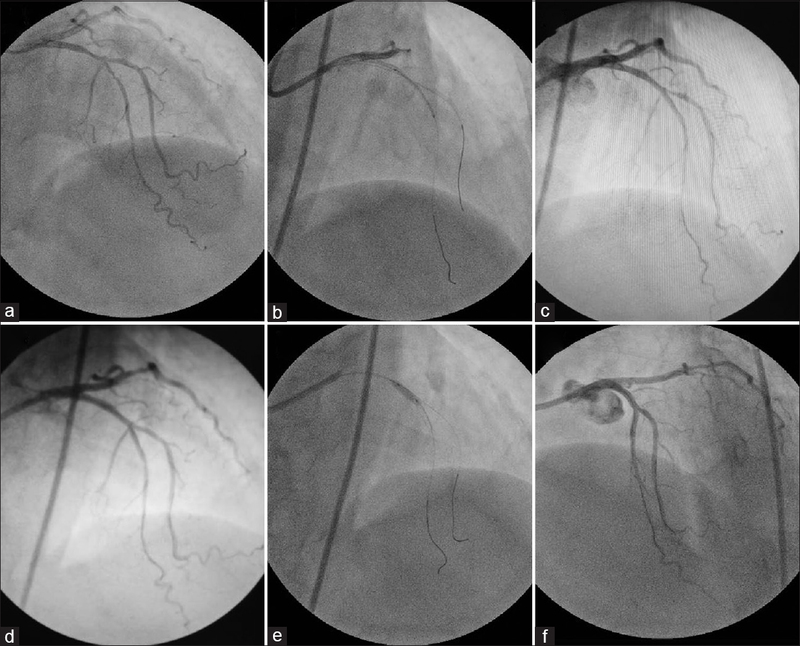 Sequential proximal optimizing technique in provisional bifurcation stenting with everolimus-eluting bioresorbable vascular scaffold: Fractal coronary bifurcation bench for comparative test between absorb and XIENCE xpedition. JACC Cardiovasc Interv 2016;9:1397-406. Gerbay A, Duprey A, Vola M, Isaaz K. Unusual complication during a percutaneous coronary intervention for a bifurcation lesion using T and protrusion technique. Cardiovasc Revasc Med 2016;17:290-1.